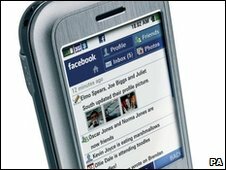 Facebook dominates the lives of mobile internet users in the UK, according to figures from a mobile industry body. The social network accounts for nearly half of all the time people in the UK spend going online using their phones. The data, from the GSM Association (GSMA), showed that people in the UK spent around 2.2bn minutes browsing the social network during December alone. The true number may be even higher as the data was only collected from three of the five UK networks. The data, which will eventually be collected from all five networks, showed that 16 million people in the UK accessed the internet from their mobile phones in December 2009. Together, they viewed a total of 6.7 billion pages and spent more than 4.8 billion minutes (60 million hours) online during the month. Facebook dominated the statistics, racking up the most unique visitors (5 million), the most number of pages viewed (2.6 million) and the most time spent on the site. Google sites were second in the list with around with 4.57 million unique users. However, they spent on average less than one-fifth of the time on its sites, compared to Facebook. Others sites that appeared in the top ten - which accounted for 70% of usage - included Yahoo, eBay and Microsoft. Facebook is currently the largest social network on the web, with around 350 million users. The six-year-old site is rolling out a new homepage design which focuses more on chat and search.